So Friday night I was getting really hungry for dinner but feeling pretty unmotivated to make it. This happens to you too, right? I was planning to reheat some leftover gluten free pasta and spaghetti sauce I had made the night before. But I wasn’t very enthused about it because I tried a new gluten free pasta this time and was not very fond of it. Lesson learned: always stick with Tinkyada brand gluten free pasta – it tastes much better! Just as I was about to quit wasting time and get off Facebook start making dinner, someone posted a Pinterest recipe to Facebook. I clicked on it to see what it was. It immediately intrigued me. 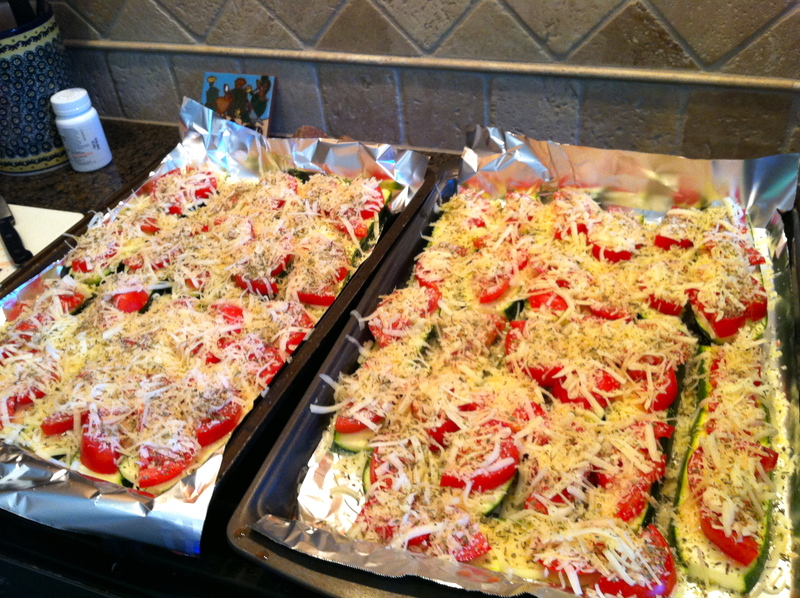 It simply said, cut a zucchini in half, add cherry tomatoes, cheese and fresh basil and bake. There were no specifics such as oven temperature or length of time to bake. I had several zucchini on their last leg in my fridge and some tomatoes not too far from that point either. I decided to give the recipe a try and this is what I came up with! My husband was taking a nap when these came out of the oven. I could not stop eating them. They are that good. Lucky for him I saved him two — which he loved! They are healthy, delicious and super easy to make! What could be better? They can be served as an appetizer or as a healthy vegetable side for a balanced meal. You can easily make how many of these you’d like based on how many people you are serving. And summer? Summer is the best time of year to make these with all the locally grown produce available – maybe even out of your own garden! Preparing these in season makes them taste simply incredible. To shorten the baking time I cut each zucchini in half lengthwise then in half again making each zucchini into four lengthwise thin pieces. This ensures the zucchini cooks through at the same time the cheese melts and allows you more of the good stuff – cheese and tomatoes! Yum! I did not have cherry tomatoes on hand so I just used the garden tomatoes I did have. I also used a combination of two kinds of cheese (mozzarella and parmesan) and two spices I had on hand (Italian seasoning & garlic salt) which tasted great. Mozzarella cheese, I bought a block of lovely full-fat mozzarella cheese from my favorite food co-op, The Wedge, but a part-skim would work well too! Preheat your oven to 400 degrees. 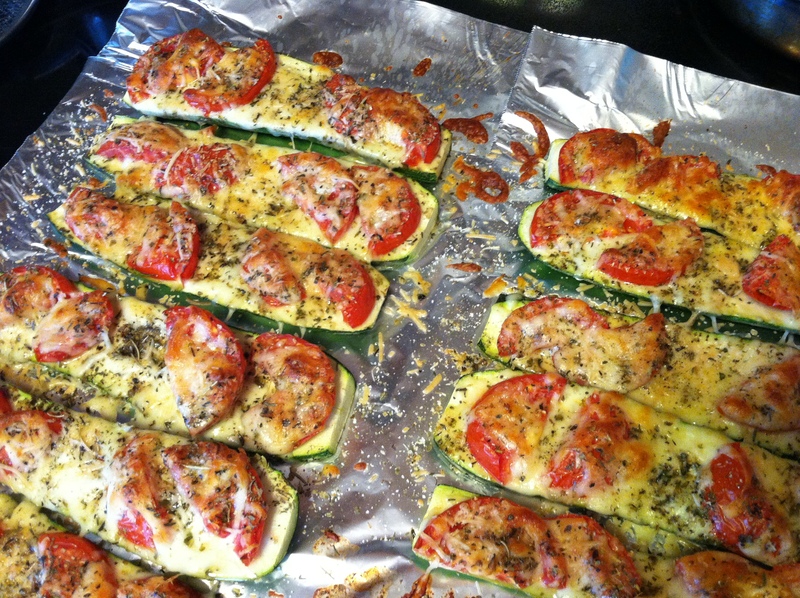 Cut each zucchini in half lengthwise, then in half again making 4 lengthwise thin pieces. You may line your pan with tinfoil for easy cleanup. Line up sliced zucchini into rows on large baking pan. Slice your tomatoes at a thickness you prefer and cut them in half. I love tomato so I bought more at the store and cut them thickly. 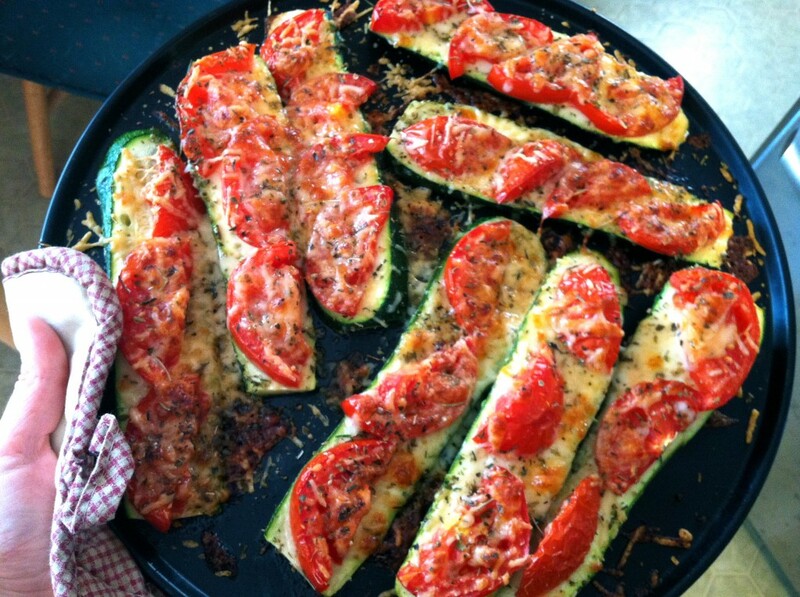 Place pieces of tomato onto zucchini. I like to add four pieces of tomato to each one. (Serving idea: if you’d like to serve more people, leave an area open in the middle of the zucchini free of tomato where you will cut each zucchini piece in half after baking). Grate some mozzarella cheese into a plate or bowl. You can decide how cheesy you want these – so grate how much you like! 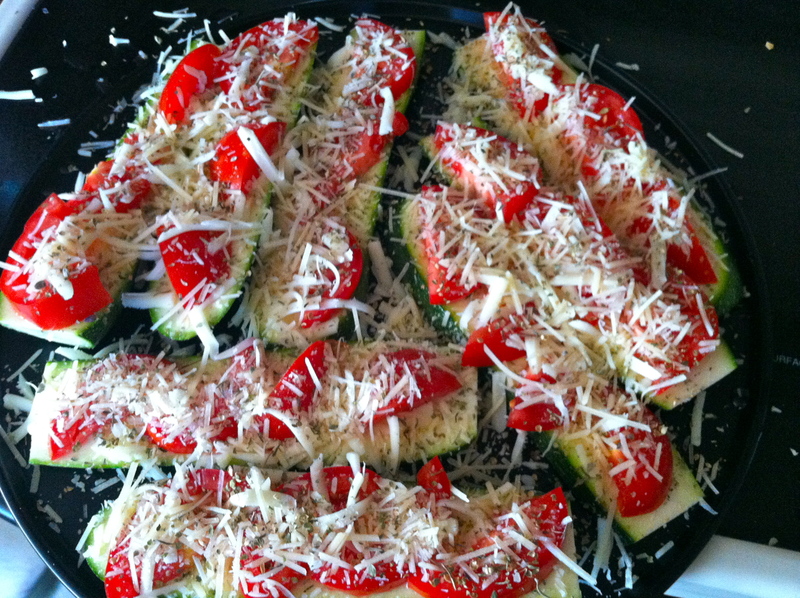 Sprinkle the freshly grated mozzarella onto the zucchini and tomatoes. Next add parmesan cheese to each, once again deciding how much you want. Then generously sprinkle Italian seasoning and garlic salt onto each. Your preparation is complete! Pop into the oven and bake about 20 minutes. This time may vary based on your oven. I bake them until the cheese gets to be a nice toasty brown. Enjoy! Because they were so good, I ended up serving these just two days later at a family celebration for my brother and his wife who are expecting their first baby in October! We are very excited to add a new member to our family soon! As soon as they were done baking, several were retrieved from the baking sheet — the anticipation was too great to wait for lunch to be served. Everyone loved them and many requested the recipe. I also received several recipe requests after sharing the above picture on our Facebook page for Diabetes Light. Here it is. I hope you enjoy! These look AMAZING! I will definitely have to try them sometime soon. Thank you for posting! Yummy!! Thanks Leah! I am so excited you are going to try them. I hope your whole family enjoys!! Luckily I only used one zucchini (courgette to us British folk) because they were delicious! Going to feature regularly now, I can assure you. So for anyone doing low carb (I am a big believer) these weigh in at only approx 15 grams for a medium to large zucchini and handful of cherry tomatoes, making them super carb safe. Anna, Thank you so much for your lovely feedback on my post. I appreciate you taking the time to comment! I am so happy to hear you loved them! And thanks for adding the carb count! Thanks for the recipe Cynthia!! And thanks for the carb count Anna! I can’t wait to try them!! You’re welcome Erin! Thanks for the comment and I hope you enjoy! Summer is a great time to make them with all the fresh zucchini and tomato in abundance! i tried the zucchini, and loved it, this week i pretty much used the same recipe only i used egg plant, and marinara sauce instead of tomato’s. the marinara adds a sweetness to it, but that is what is good about this recipe, can mix it up a bit and still basically use the same recipe. Great ideas Leonard! I’m happy to hear you have enjoyed the recipe and are thinking of some new ways to enjoy it! Only have a couple zucchini left this season and need to choose between recipes to make.